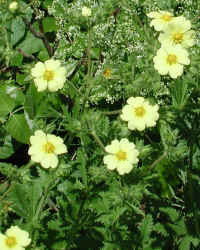 (Rough-Fruited Cinquefoil (Potentilla recta) - 01) The rough-fruited cinquefoil is an upright species of cinquefoil that can have up to seven leaflets in each palmate leaf. 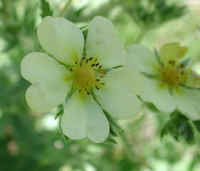 The flowers are a pale yellow and grow in a flat terminal cluster. 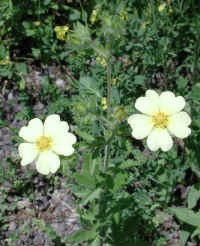 (Rough-Fruited Cinquefoil (Potentilla recta) - 02) Like the common cinquefoil, the 1/2 inch diameter flower of the rough-footed cinquefoil has five petals and numerous stamens and pistils. (Rough-Fruited Cinquefoil (Potentilla recta) - 02a) In this bee's eye view of the center of the rough-fruited cinquefoil, we get a closer look at the numerous stamens and pistils. 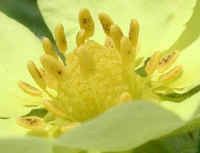 The central "disc" is composed of tightly packed pistils. 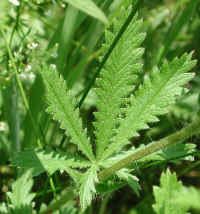 (Rough-Fruited Cinquefoil (Potentilla recta) - 03) In this photo of the rough-fruited cinquefoil, we can see the leaves growing alternately along the stem. 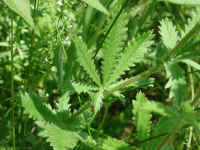 (Rough-Fruited Cinquefoil (Potentilla recta) - 03a) In this enlarged photo of a rough-fruited cinquefoil leaf, we can more clearly see its palmate structure with its seven leaflets. 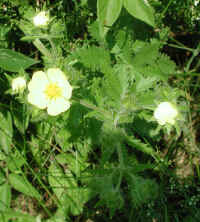 (Rough-Fruited Cinquefoil (Potentilla recta) - 04) In this side photo of the rough-fruited cinquefoil, we can see the buds of future flowers developing alongside the open flower. (Rough-Fruited Cinquefoil (Potentilla recta) - 04a) This is another bee's eye view of the numerous stamens and pistils that make up the central portion of the rough-fruited cinquefoil flower. The actual size of the stamens and pistils in this photo is only about 4 millimeters (5/32 inch) across from the stamens on the left to the stamens on the right. 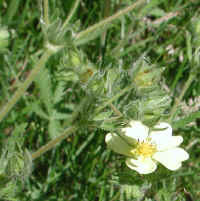 (Rough-Fruited Cinquefoil (Potentilla recta) - 05) This photo presents a good view of the upright stem of the rough-fruited cinquefoil, as compared to the common cinquefoil which grows in crawling runners. 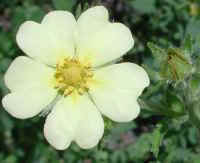 There is another species of upright cinquefoil, tall cinquefoil (P. arguta), which has brownish hairs on the stems and flowers which are white or cream colored. (Rough-Fruited Cinquefoil (Potentilla recta) - 05a) This photo gives us a closer look at the top of the rough-fruited cinquefoil and the budded cymes. 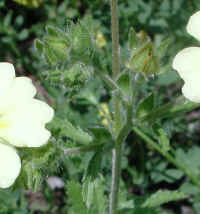 (Rough-Fruited Cinquefoil (Potentilla recta) - 06) In this photo, we can compare the size of the rough-fruited cinquefoil bud to the size of a fully opened flower which is 1/2 inch in diameter. 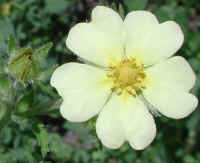 (Rough-Fruited Cinquefoil (Potentilla recta) - 07) The flowers of the rough-fruited cinquefoil appear as either single terminal flowers or as a few in a cyme. 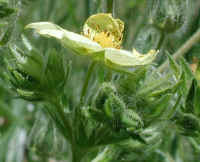 This difference can be seen in bud form in the center of the photo. 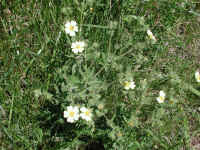 (Rough-Fruited Cinquefoil (Potentilla recta) - 08) This is a small patch of rough-fruited cinquefoil. 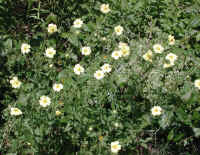 (Rough-Fruited Cinquefoil (Potentilla recta) - 09) This is another look at a patch of rough-fruited cinquefoil. 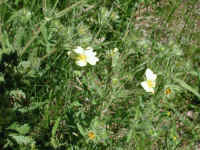 (Rough-Fruited Cinquefoil (Potentilla recta) - 10) This is another small patch of rough-fruited cinquefoil that we spotted growing along the side of the road. 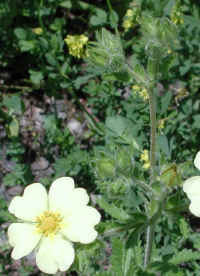 (Rough-Fruited Cinquefoil (Potentilla recta) - 11) This clump of rough-fruited cinquefoil is loaded with bud that are beginning to open. 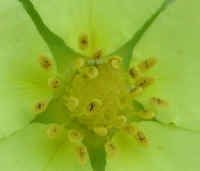 (Rough-Fruited Cinquefoil (Potentilla recta) - 11a) In this photo of the rough-fruited cinquefoil we have a closer look at the terminal bud clusters and an open flower. 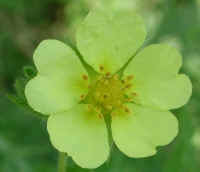 (Rough-Fruited Cinquefoil (Potentilla recta) - 12) To us, the delicate heart-shaped petals of the 1/2 inch diameter rough-fruited cinquefoil flowers are a reminder that we are to love, respect, and care for the whole of God's creation. (Rough-Fruited Cinquefoil (Potentilla recta) - 12a) One of the nice things about macro-photography is that it allows us to see details that we would most often miss with the naked eye. 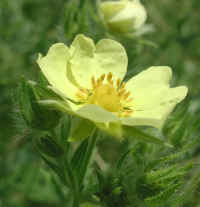 One of these detail is the sunburst of darker yellow at the base of each of the 1/4 inch long petals of the rough-fruited cinquefoil. 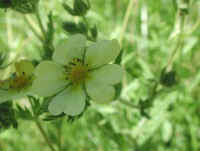 (Rough-Fruited Cinquefoil (Potentilla recta) - 13) This is another look at a couple of the pale yellow rough-fruited cinquefoil flowers. (Rough-Fruited Cinquefoil (Potentilla recta) - 14) In this side view we get a different perspective of the upright growing rough-fruited cinquefoil. 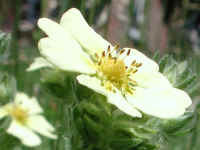 (Rough-Fruited Cinquefoil (Potentilla recta) - 14a) In the close-up side view, we can see a rough-fruited cinquefoil flower and some of the buds. 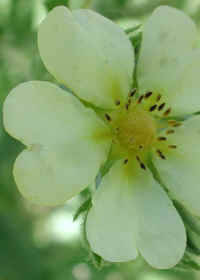 (Rough-Fruited Cinquefoil (Potentilla recta) - 14b) We like the way the sun casts the shadows of this rough-fruited cinquefoil's stamens upon its petals. It seems to add to the beauty.